Shops considering buying an aluminum-ready pulse welder need to go beyond checking the device’s specs and training welders and ensure their staff are practicing on the device as well. 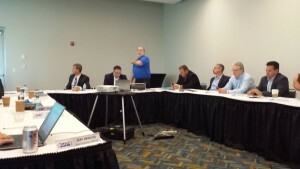 Because while the F-150 and other more aluminum-intensive vehicles will eventually hit your shop, it could be a long time before they do, participants noted during the Society of Collision Repair Specialists open board meeting Thursday in Detroit. This could be problematic if you only see one F-150 a year — or as it was put during the meeting — one aluminum vehicle between I-CAR five-year welding recertifications; you don’t want to be in the position where your skills grow rusty. Your business needs a culture of practice, SCRS board members stressed during the meeting held during the Collision Industry Conference/NACE week. You must “monthly train,” SCRS board member Barry Dorn said. We’ll report more on the discussion and presentation by Education Committee members Kye Yeung and Toby Chess further later; continue to check Repairer Driven News for updates. However, while you’re waiting, check out Chess’ guide to some Pulse Welder Models’ Features and Specifications.